Given that the soil of Belgium was to be the scene on which many of the major actions of the war were to be played out, the role of Belgium during the war is not often written about. Whilst the majority of the country was occupied by the Germans and the fields of Flanders were bitterly fought over, the village of Baarle-Hertog on the north-east frontier of Belgium remained unoccupied. The reason? This piece of Belgian sovereign territory is actually located within the Netherlands. A complex border relationship dating back hundreds of years means that parcels of land remain Belgian; the village itself is split and to this day run jointly by the Belgian and Dutch authorities. During the war it became an enclave for escaped soldiers, spies, refugees and smuggling. It was also the perfect location from which to eavesdrop on German communications. The memoir itself is a translation of the original, published in 1946. However to this Brendan Whyte has added a useful history of the area and an account of the development of radio before and during the war years, as well as a short biography of the author. Goldschmidt himself had been an electrical engineer for a wireless company before the war. Declared unfit for active service, he became a civilian radio engineer and was sent to Baarle-Hertog in March 1915. He later joined the Reserve Engineers of the Belgian Army and spent time on the western front, being awarded the Croix de Guerre and the Military Cross. 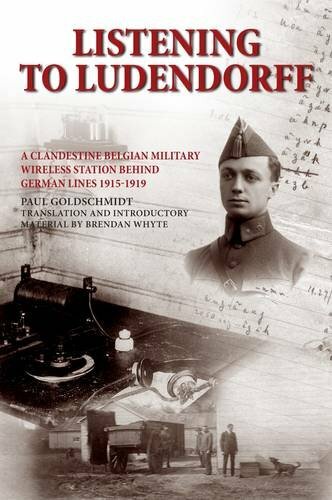 The memoir itself is relatively short, covering mainly the problem of assembling the parts for the wireless station under the noses of the Dutch and German authorities. In the end they operated under the premise that a refugee camp was being set up and equipment was required for lighting Concerns that the Germans might shell the station were allayed by positioning it in such a location that any artillery bombardment would likely also hit the neutral Dutch areas of the enclave. Bit by bit the wireless station was assembled, despite some close calls along the way, and was finished in October 1915. The station could intercept the communications of the German surface fleet, submarines, and zeppelins, and assist to determine positions of German antennae on the western front. However Goldschmidt does not go into detail about the information the station was able to gather, and unfortunately Whyte is unable to expand on this as the station records were largely destroyed. There are comprehensive footnotes and a great selection of photographs, particularly of the construction of the station. Overall this is a quite technical and niche, but fascinating tale.